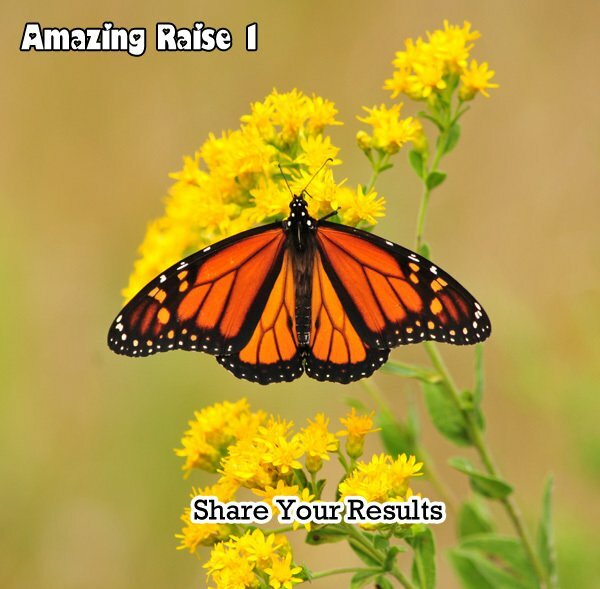 Amazing Raise 1 is a North American challenge to raise monarch butterflies to release for the 2013 monarch migration. If you’re interested in joining, you can sign up through October 2013. 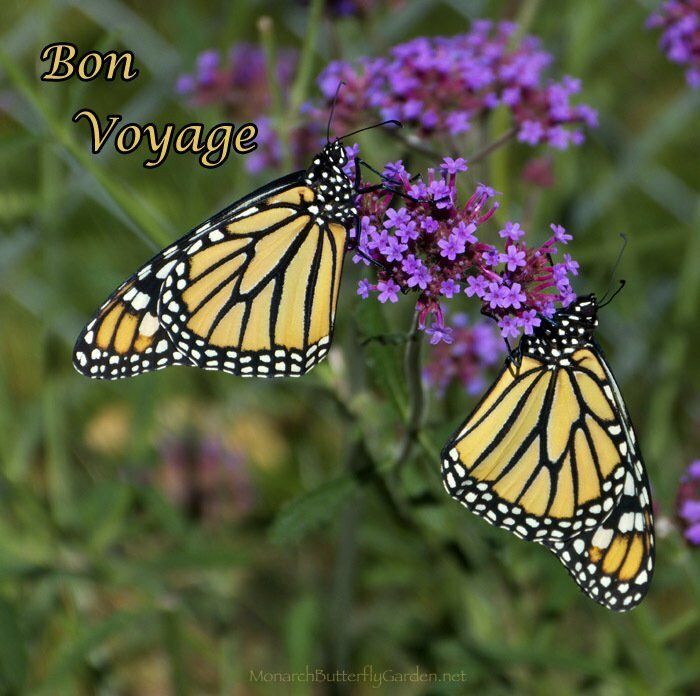 Amazing Raise 1 is coming to an end, so it’s time to report how many butterflies you released for the 2013 monarch migration. If you’ve still got some raising to do, raise on! But please report your final results on the bottom of this page when you’re finished. They eventually left me 16, just after Suzanne, The Butterfly Lady, sent me a smaller batch as ‘raise insurance’. After all was said and done, I had 21 baby monarch caterpillars crawling about. I raised Suzanne’s caterpillars in my new mesh laundry hamper. Those 5 caterpillars hatched first. I kept the other 16 caterpillars in my caterpillar castle. You can check out both of these cages on the Amazing Raise supplies page. I’m happy to report, there were no MIA caterpillars during Amazing Raise 1. Every once in a while, when raising this many caterpillars, some crazy cat will sneak off while I’m cleaning their cage. This year, I kept a closer eye on them. One of the reasons I set up this raise, is because I haven’t lost a monarch to disease for many years. My hope is that by discussing my raising techniques, I can help others raise healthier monarchs. Part of my disease-free-streak is probably luck, but maybe there is something I’m also doing , that most people don’t when raising monarchs. The only health scare I had during the raise was when one of my new chrysalides was sporting symmetrical black lines. They didn’t appear to be symptomatic of any monarch disease I had seen or researched. The lines also never grew over time. 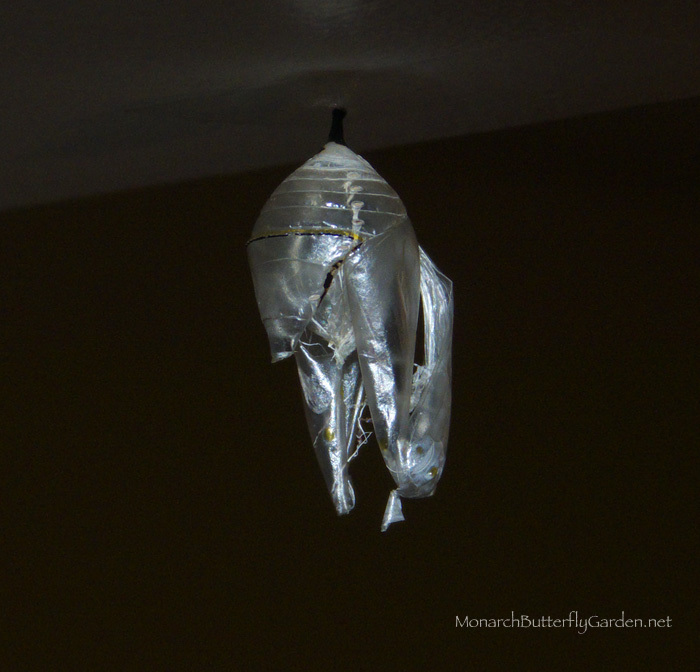 A few days ago, a seemingly healthy monarch male emerged from this chrysalis. 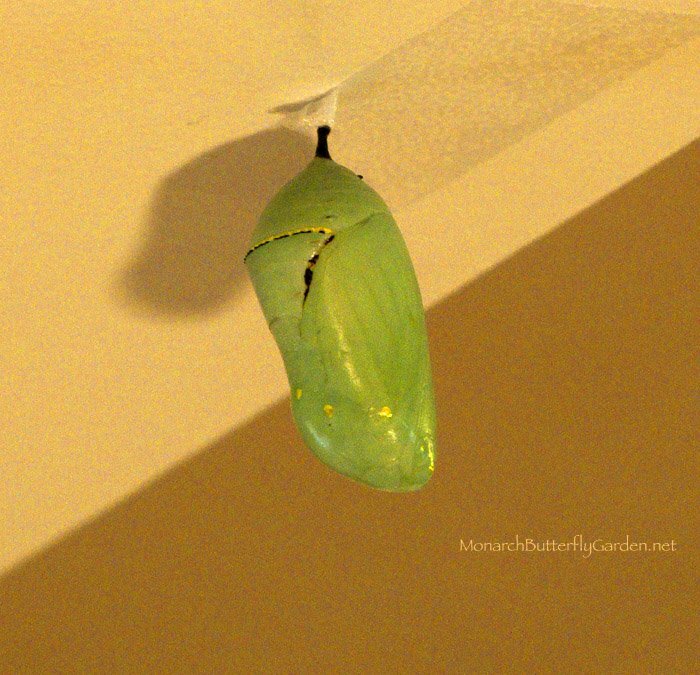 There were no lines on the new monarch, just the chrysalis. My guess is this monarch was harassed by a cage-mate before its chrysalis had hardened. This is usually the category where some freak accident ends a monarch life too soon. Previous raising accidents include drowning, smooshing, falling, and zipping. Just when you think you’re aware of every potential safety hazard…a new one rears its ugly head. Well, this year was different. Zero accidents to report! Most of these monarchs had a garden full of migrating monarchs to welcome them upon release. We had about two dozen monarchs stop by our fueling station on the way to their migration destination. There are still a few stragglers stocking up on nectar, but they should all be flying south in the next couple days. Amazing Raise 1 couldn’t have went any better on this end. Beyond the actual raising, I was happy that so many signed up and posted great comments and questions on every raise page. Thank you for your participation. Even if you didn’t participate, I hope that following along will help you raise future generations of healthy monarch butterflies. It’s time to find out how many monarchs you released to help raise the migration. Please post your results below and share the most helpful tip you learned about raising migration monarchs. 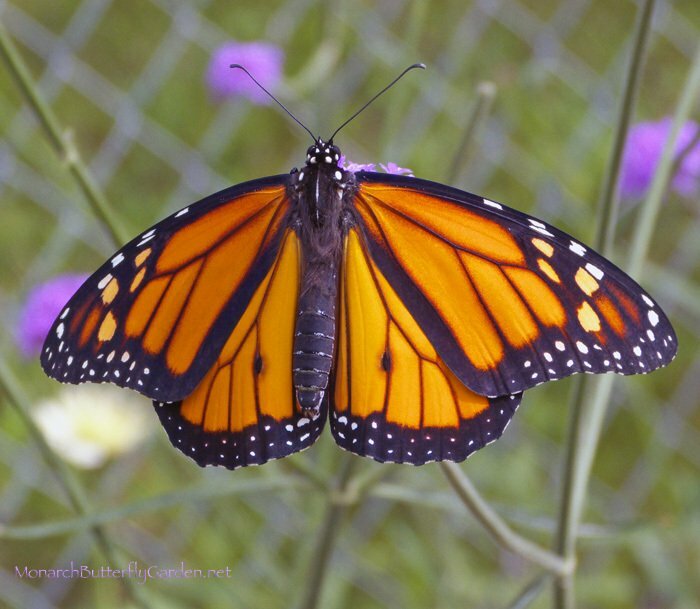 Thank you for any and all monarch contributions…every monarch counts! I did not count how many were released but estimate we had approximately 20 and sadly a few losses as we realized some died due to pesticides most likely. We have 8 chrysalises right now. Sounds like a pretty successful season Jeanne! Sorry to hear your milkweed was treated with pesticides. If you fall plant seeds/plants or start with plants next spring, hopefully you can avoid them next season. Released the last of this year. Raised 9 and released 9, 4 male and 5 female hoping that atleast half of them make it to their wintering areas safely. What a fun experience. Can’t wait for next year. Thanks for all your great ideas to help with the journey. Excellent results Brian! Once you get a good process down, I think a 95% survival rate is achievable. It sounds like this process was a good fit for you. Thanks for participating! I released four–all the eggs I could find around here. But they were beautiful! Thanks for your contribution Liz! We released 4 here in northwest Ohio last week! We also raised and released several others earlier in the summer (not migrating generation). Nice work Anne! I know the Ohio season got started extremely late from other reports I received over the summer. I’m happy you were still able to help raise the migration. I raised 7 Monarchs from my milkweed plants in CT this year (2013). This is a sad year in CT for Monarchs. Last year, I released over 350 Monarchs. I now have 2 more caterpillars, which hatched from eggs that I received from The Butterfly Lady. They are healthy. Way to finish the season Denise! Please give us on update after your butterflies are released. I love the enthusiasm found here! Hi Darcie, two dozen is a solid contribution after a super slow start to the season. Thank you for helping to raise the migration! Hi Tonya, if you get a chance please post again to let us know how many healthy butterflies you release for the migration. Good luck with all your babies! Living in Southern California and being a waystation 5375 I am still finding caterpillars. As of right now I still have 31 chrisalis ,2 in “J”, 11 caterpillars and we have released 377. I still am in hopes of growing this number. Last year we released 500. But the numbers are down for me. I am still very pleased with what has been accomplished. We are also a tagging station for Cal Poly San Luis Obispo Calif. and on 9/17/2013 I recieved notification that number 45808 a male born on 9/1/2013 was sighted, alive and hanging around a private yard with lots of milkweed, on Sept. 16 in University City near UCSD San Deigo. This monarch male has flown 90 miles in 16 days. I am over the moon with joy. I hope he makes it all the way to Mexico the border is close now. I would like to thank you Tony for all your wonderful advice I always learn something new from sharing. I have grown so much and I no longer feel alone in my hobby raising monarchs. I have started to speak to garden clubs. And have gone in a few classrooms and spoke with the children. Last year the young girl recognized me from the year before and see cried out the butterfly lady is back. It made me feel so full of joy to talk with the next generation of stewards. Keep up this fantastic work you are doing Tony. Our friendly pollinators are counting on all of us to care so that they can carry on. Hi Monika, it sounds like another successful season on the West Coast…and how exciting to get a report of your tagged butterfly while it’s still ALIVE!I have a few photos of tagged butterflies. I will send them to Monarch Watch so other people can have your same happy experience. Thank you for being an active member of the community and for sharing your experience too. I’ve already taken some of your advice. I went to Target and got a hand held cordless dirt devil for frass next season. I have a feeling this is going to make cage cleaning a lot easier. Thank you for what you’re doing for the west coast monarchs and for your community. And take a little time to relax this monarch off-season. You’ve earned it! Have 3 more chrysalis to hatch and will then report results. Have not lost any yet and even had some instar from eggs. Thanks for all your tips and nice pictures. V. Bonariensis is a fabulous butterfly attractor. Added some larval and nectar plants from Prairie Nursery this fall. Bur am still searching for either plants or seeds of Asclepias Purpurascens any ideas? Do you have almost equal numbers of male and female that are raised and released as I am finding the numbers are almost equal. Hi Brian, great to hear things are running smoothly so far…looking forward to hearing your final results. I don’t typically count butterflies I raise, but it seems like there are typically more males than females. But strangely, when raising a large batch, it seems like a female always hatches first. It was interesting to me that most of the early butterflies were female and the later ones were male. I started with 20 eggs or baby cats found on one large swamp milkweed in my yard. One first instar vanished into thin air and one had one of those unfortunate smooshing incidents. Of the 18 that made it to butterflyhood, one fell in the jar and developed misshaped wings. I did release him but he didn’t make it. The remaining 17 emerged between 8/14 and 9/9. 7 were female and 10 were male. 17 out of 20 is exceptional…and when you compare that to the 1-5% survival rate outside, the monarchs owe you a debt of gratitude. Thanks for joining the community and being such an active participant. Glad to hear you are enjoying the pictures, and I hope you learned something that will help you raise more healthy monarchs next season. Monarch in July and 1 Monarch in August. They landed on my Butterfly Bush, drank some nectar and flew away without laying any eggs on my 12 to 15 Milkweed plants. I checked 2 other places I have found Milkweed and have not found any eggs. Hopefully next year will be better. 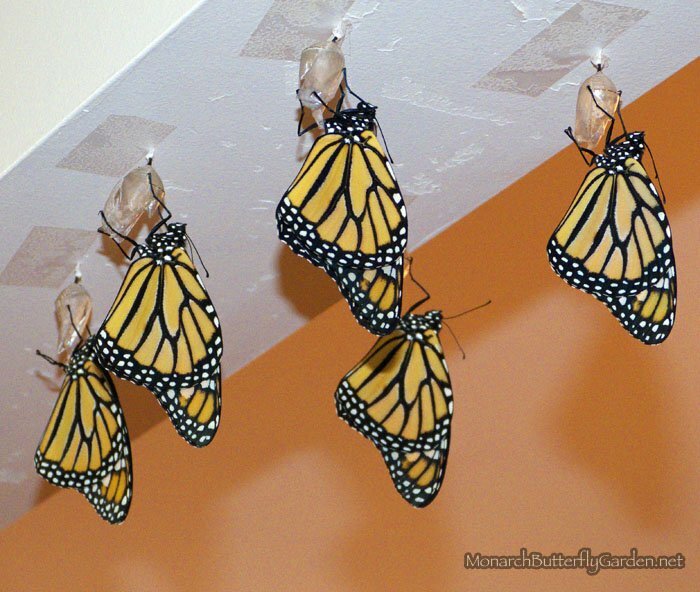 In 2011 I raised, tagged and let 32 Monarchs go. I live in Lakeville, New York. Hi Carol, so much sad monarch news from the east coast this season. I hope things rebound in your garden next season. For now, consider diversifying your milkweed by fall planting seeds/plants. I will be posting about this soon. I have raised approx 100 black swallowtails, 2 question marks, one comma and one red spotted purple. Hi Connie, I know Indiana had it rough last season with the drought too. You guys are due for a good monarch season. I hope things come together for Indy in 2014. It sounds like you are having great success with the BST’s though…congrats!